Well we have finally done it. We are on the road. For those who have received and actually read the Christmas letter I am sure you noted that we were to leave the Joiners on Friday straight after I finished school and head to Tiaro. Unfortunately Chris and the boys had already gone into full holiday mode and were lying around the pool with obviously no intentions of going anywhere today. I must say it was bloody hot and as nice as the free camp behind the pub in Tiaro is, the pool was more inviting. So Saturday we were off at 0734 (give or take a few seconds) and here we are at Cotton Tree on the Sunshine Coast. I did say there was not going to be any Christmas lights this year, as we are only here for two weeks and not the usual three. Let me tell you that looking at Harry with those big sad eyes when I told him the no light story was more than we could handle, so out came the lights for another year. It really didn't take long and does look good. The boys love it and dress up each night in their Christmas gear and hand out lollies to the kids that stream past to view the extravaganza (I guess the way the world is going they should have a blue card!!!!). Kids really do make this time of year so so special. It's good to see all the regular campers again although it is sad that Jenny and Jim won't be able to get up here until after we leave due to other commitments. I hate to say it but we do miss them. But boy is it quieter. The Coombes are running fashionably late and won't be arriving until Thursday, as Kelvin is working his guts out with Roz no doubt flossing around doing nothing. Trevor and Desley always turn up a day early to set up the mighty canvas extravaganza. It is a mighty erection that really takes all Trevor's energy to get up (with Desley helping of course). But once 'up' it is as 'stiff as' with not a wrinkle to be seen. Something really to be proud of. The kids really love these two and seem to spend more time talking to them than us. Dave and Wendy are again behind us in their new van and complete the whole big happy family feel of this park - it's this rather than the physical surrounds that keeps us coming back. So the next few weeks will see a bit of relaxing and winding down, a little socialising and both of us finishing off the jobs we didn't get around to prior to our departure. Chris is still coming to grips with driving the Patrol around this very busy place. Being her normal very thorough self I found her out yesterday measuring the height of the car as all the parking around here is undercover. It was very comforting to me that she was being so careful until she came back from the shopping centre with a hair raising story. You see the car measured 2.2 metres high (including roof racks) but upon entering the undercover car park she saw the sign that said "Clearance 1.9 Metres". Relying on her memory she recalled the height of the car as 1.2 metres (only a metre short) so off she went. Don't panic, no damage done, but she did realise her mistake and luckily stopped half way up the ramp causing a minor traffic jam that I have been informed could be seen from space. Of course I freaked but am sure it will be a story that I will retell many times. Well it is now nearly two weeks from when we left Bundy and I must hasten to say the past two weeks have not been as relaxing as hoped. It seems both Chris and myself have been working every day completing endless jobs that needed to be done. A few of my fun jobs included replacing one of the fridge cooling fans, converting the range hood to a 12 volt fan and light, and making and installing 'Luxon' bedside lights for the boys (these produce great light and uses about 0.2 amp). I then had to replace the timber under one of the lounge cushions, fix a few window locks and wire up the 12 volt fan over our bed and the phone chargers. Then to add insult to injury one of our water tanks split and was only discovered 2 days before we set off. Trying to get a tank sent up from Brisbane this close to Christmas was a nightmare. Thank god (I can say that as my son goes to a Catholic school) for Kelvin's taxi service as Chris had the car most of the time surveying all undercover car parks on the coast ( I think she intends to publish a book on the subject). I finished the tank at about 7-00pm the night before departure. I just love a dead line. Chris did everything else including the Christmas cards and getting all the presents organised. She tells me she has been working her guts out!!!!!!!. We did manage to catch up with friends Pam, Frank and kids, Gail, Michael and kids, Helen and Geoff, Ross, Michelle and kids, Jill, Craig and Matty and the Stevens clan. It was great to see them all and hope to be able to spend more time with them on our return. 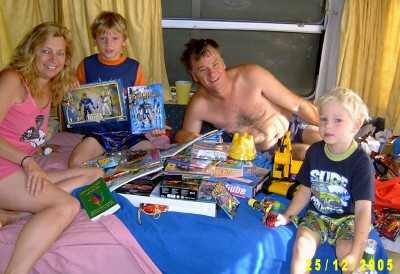 So Friday morning (23-12-05) was move out of Cotton Tree day . Roz and Kelvin have sub-let our site for our third week which was really great. We were packed up and ready to rock and roll by 10-00am. We had a large farewell crowd which was nice. Kelvin and Trevor were both in tears and literally sobbing at the thought of not seeing us for a year. Nice touch boys. This storm was getting blacker and blacker. Then the rain started. Over the UHF radio we heard a guy calling for the caravan from Bundaberg (only yesterday I had a sticker "Bundaberg QLD" made and put it on the back of the van). It was my old mate in the semi. (For those of you that don't believe in the 'what goes around comes around' theory on life you need to rethink). He was calling me up to say the road was very slippery with lots of water over it. I thanked him and slowed down. A couple of minutes later he called again to tell us it was hailing big chunks of ice and insisted that I pulled over straight away. There are not many places on this stretch of road to do this safely. Then it started. It sounded like somebody was on the roof with a hammer. I found the best place I could and stopped. We got hammered for what seemed like ages. The hail was as big as a large marbles but luckily most seemed soft and splattered on impact. I was worried - it is quite unnerving sitting in a car during a hail storm coming directly at the windscreen. The road was thick with ice. It seemed to pass so off we went again. We wouldn't have gone 1 km and we got hammered yet again. Couldn't believe it. Our new car. What was it going to look like after this? Finally it slowed and we got out of there. We were very lucky as the car looks fine and only minor hail damage to the van (what's a few more dents in the old girl). As for my old mate in the semi. I don't know who he is and we didn't hear from him again but thanks. Things could have been a lot worse without his warning and advice. Karma. So our first real day on the road was a little more exciting than we had planned. Hope they are not all like that. 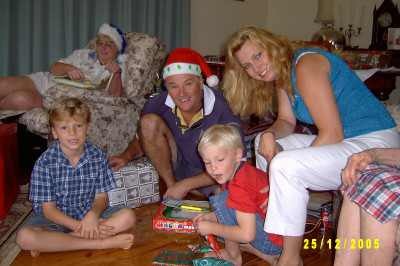 We spent the night at Girraween National Park and had a good sleep.We set off early Christmas Eve on our way to Armidale where we will be spending Christmas with our brother-in-law Tony's family. On the way we stopped in Glen Innes as the Murray family had arranged to meet us there. It was great to see them all and we really appreciated the fact they had travelled over an hour to see us. So here we are at Armidale and Christmas day is again upon us. Tony's sister Anne and her husband Tim have been very kind and welcomed us into their home. They have a lovely B&B perched high on the hill overlooking the city. 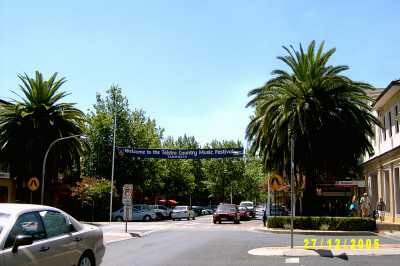 Armidale is in fact the highest city in Australia at over 1000 metres. The day started with the kids out sleeping the parents for the second year running. Chris and myself lying there twiddling our thumbs waiting for them to wake. The boys were so excited about Santa coming and loved all their gifts. The extended family then all gathered for present opening and a lovely lunch. I spent the afternoon installing the twin 8 inch screen dual DVD player in the car. This should be a real asset on those long driving days. We will leave Armidale on Tuesday 27/12/05 and most likely head for Gunnedah to see an old friend we haven't seen for about 15 years. After that ???????? The plan is to be in Broken Hill for New Years Eve but whether we will make it or not??? Oh, the joy of being free and easy ( I think I have always be free and very easy!!!!). After leaving Armidale we dropped into Tamworth and had a good look around. 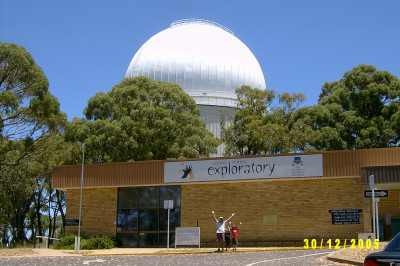 It's much bigger than I remembered (either that or it has grown in the past 25 years).We went shopping, went up to the lookout overlooking the city and then had lunch in a beautiful park in the middle of town. Of course you can't visit Tamworth without a a trip to the 12 metre tall "Golden Guitar". It was then back into the car and off to Gunnedah. As I said earlier we haven't seen Debbie for nearly 17 years and have never met her husband of a few years, Peter. They have recently built a lovely new home and had room in their backyard for the "Mighty Grand Tourer". Debbie hasn't changed at all in the past 17 years (wish I hadn't). Peter is a genuine nice bloke and we got on really well (or he just tolerated me really well). We had a great time and talked late into the night. They kindly offered to take us skiing the next day out to Lake Keepit which was an offer too good to refuse. It was unfortunately very windy but we went anyway. The kids had an absolute ball in the ski biscuit. We weren't sure how Harry would go as he is a little cautious, but to our surprise he loved it. Lake Keepit is a great spot with incredibile facilities. You can stay in the caravan park section with all the usual trimmings or just pull up on the lake edge and camp and still have access to the amenities block. There are a number of good playgrounds, a covered wading pool for the little kids and for the bigger kids a floating pontoon complete with a slippery slide into the water. The list goes on, a roller blading /skate board area, a bottle shop and boat ramp. All this for a very minimal fee. If you are in the area put it on your must visit list. 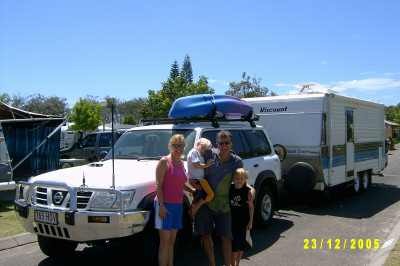 So it was goodbye to Debbie, Peter and Tamika (Deb's daughter) and time to hit the road for the Warrumbungles. We arrived just after lunch and boy was it hot. In fact it was 45 degrees and stayed that temperature for about the next 4 days. It was not only hot but also windy, a very hot wind. We now know how a chook feels in a fan forced oven. Not pleasant. The Warrumbungle National Park is pretty but very dry. We stayed for two nights and did one 6.6 km walk. Between us we consumed about 6 litres of water. As you can see from the photo it was worth the effort. 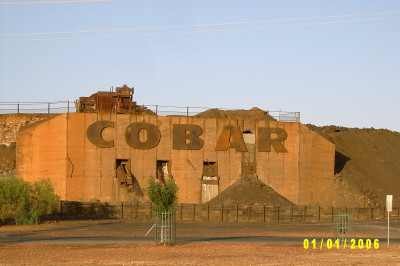 The next leg was a long drive to Cobar. We had intended to stay at Nyngan to break the trip but the caravan park didn't have a pool and being so hot we thought we would be cooler staying in the car. That was nearly a 400 km day . We arrived in Cobar and set up the van, then headed straight to the town pool, as this caravan park was without a pool as well. It cost us $9.00 to have a swim. I have never paid to have a swim before but let me tell you it was the best $9.00 we have ever spent. We stayed for hours hoping the temperature would drop but it did'nt. And guess what. It's New Years Eve. We were all hot, tired and grumpy so after dinner we all went to bed. I don't think we even made it to 9.00pm. It was nice to have power again and lovely to have the air con going all night. Ah, the small pleasures in life. Well guys, that's it for December and for 2005. It was a good year for the Parfitts even though a little hectic at times getting ready for this trip. Stay tuned for the next thrilling update. A wise man once said - "What you are is what you have been, and what you will be is what you do now."